The Western Region Agricultural Research Center, National Agricultural and Food Research Organization (WARC/NARO) is determined to engage in research and development to solve various problems facing agriculture in hilly and semi-mountainous areas, which are characteristic of the Western Region of Japan, and to revitalize its rural areas. We are now pursuing research in conjunction with the 4th mid-term plan of NARO. We are also actively promoting cooperation among industry, academia, and government so as to concentrate on pioneering research and development that can contribute to the advancement of the agriculture and food industry sector of the Western Region. 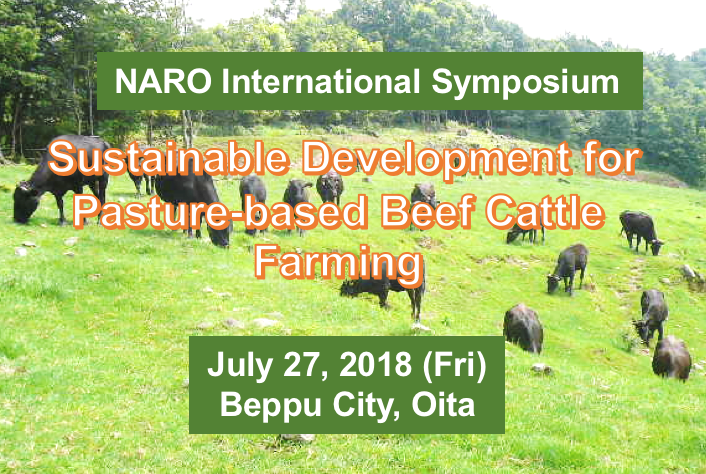 The WARC/NARO is organizing an international symposium on "Sustainable Development for Pasture-based Beef Cattle Farming" to be held at Beppu Housenso in Aoyama-cho, Beppu City, Oita Prefecture on July 27, 2018. This symposium will focus on the pasture-based beef cattle farming in New Zealand which is recognized for being competitive globally, and is aimed at (1) identifying issues that must be addressed in Japanese beef cattle production, (2) understanding the mutual strength, weakness and opportunities for beef cattle farming in Japan and New Zealand, and (3) finding common research areas for sustainable development. Details are available here. The WARC/NARO has successfully formulated a biological agrochemical "Flightless ladybug" (a harlequin ladybird beetle, Harmonia axyridis which genetically lacks the capacity to fly) which is now commercially available as a pesticide for greenhouse grown vegetable crops. A manual on how to use this pesticide has also been issued so that farmers who interested in environmentally friendly or organic farming can easily use this biological control agent. The harlequin ladybird beetle has been attracting attention as a natural pesticide because it preys on a lot of aphids which is an important pest of vegetables grown in greenhouses. However, the adult insects would usually fly away and do not stay in greenhouse facilities. Therefore, WARC/ NARO started to search for a natural strain with reduced flying ability. Extensive crossbreeding of this strain resulted in a strain which totally lacked the capacity to fly. The biological agrochemical "Flightless ladybug" can be formulated in a larval stage so that even after the larvae develop into adults, the effects in controlling aphid infestation persist. The application has been demonstrated in the Kinki and Shikoku regions in collaboration with prefectural research centers. The Agrisect Inc. has formulated "Flightless ladybug" which has been registered as a biological pesticide and available in the market.